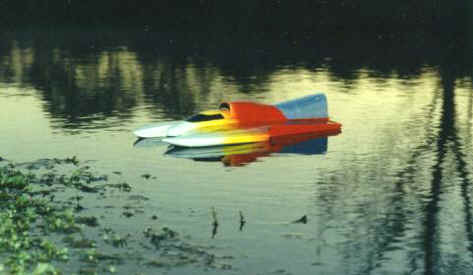 This project began with a Blew By You Volcanic Splash hull kit. 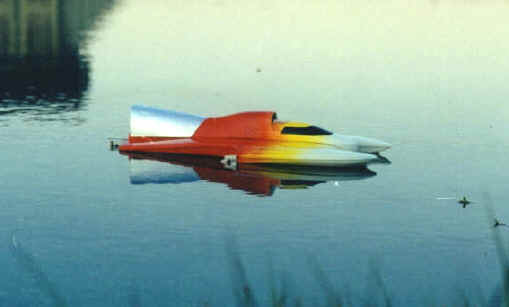 http://www.bbyracing.com When the kit arrives, you will begin with the hull bottom. The first thing to do is trim the hull bottom and top to fit together well. This is easy to do if the trim lines are followed. Next item is to add plywood doublers and floatation foam. 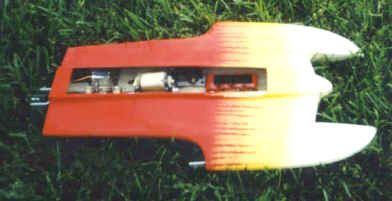 I epoxy an 1/8" basswood or plywood turn fin doubler on right sponson inside. I used two pieces of basswood and cris-crossed the wood grain for strength. Make a transom doubler and glue in place. Epoxy blue foam into the sponsons for floatation and strength. Water seal everything wood at this point. I use epoxy resin thinned with rubbing alcohol. Don't use anything else that may react with the foam or plastic. Now we are ready to glue the hull together. I sand the inside of the hull for a better glue bond. Put the hull bottom and deck together. Place tape first in the center of the transom and then on each tip holding the hull together in the right fit. Now place tape on the sides close to the rear of the sponsons to create the dihedral. The dihedral should be 1/8" each side. The trick is to get the right tension and keep the transom level in the rear at the same time. It is easy to accidentally put a twist in the hull at this stage. Once it is close, start adding more tape to the sponsons. Add one piece per side to prevent twisting. When done, the whole hull will be held together with tape and everything will be true. I build mine on glass because it is flat. Now it is ready to glue. I use thin CA first. I start at the rear of the sponsons. Put a spot on each side and make sure everything is still flat and the dihedral is still right. If all is square, drip CA in the lip and let it run toward the tip of the sponson. We are holding the hull upside down of course. Work your way around the whole hull allowing time for drying as you go. If possible, use epoxy on the transom. It tends to be more flexible. Let everything dry overnight. The next day, slowly remove all the tape and ensure all the joints are well glued. I dripped thin CA on the inside of the hull starting at the rear of the sponsons and letting it run in the seam to the transom. At this point I spray a light mist of dark lacquer paint over the hull to serve as a sanding reference. I use 80 grit sandpaper on a sanding block. Sand all the surfaces. This will remove the minor imperfections and sharpen the edges in many places. The sponsons should come out fairly square when done. The sponson edges can be sharpened with putty and CA for top performance. When done I prime with flat white paint and block sand again. Be careful, paint can add weight. I sand well between coats to keep weight down. The actual color is added later after running the hull. I never paint a hull unless I know it will run right. The hull should weigh around 14 ozs. when done. I make my turn fin out of 0.030” stainless steel. It extends about 1.5" below the running surface and is canted inward at 7 degrees. The motor I have used sucessfully in this hull is a D3.5 11/3 which is hand tuned by Ed Hughey for peak performance. Several other options are available but I have found this to be very reliable and inexpensive. I use a Hughey gearbox slightly modified. First remove the lower rod totally and then rotate the rear plate 180 degrees. Shave about 2-3mm off the "bottom" so it sits lower. When finished, the flex adapter will sit on the bottom of the hull if need be. The gear box is set up so that the flex adapter sits down in the rear sponson tub slightly. It should fit under the turbine cowling but stand above the line of the bodywork for easy motor maintenance. Mount the flex shaft to give a slight curve from the strut to the output shaft. 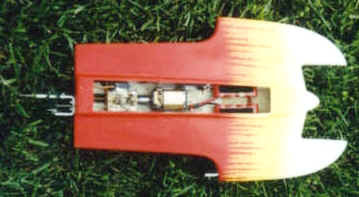 A Hughey hardware package with a custom extended 2" strut using standard Hughey 0.125" flex cable. Put the rudder to the right side of the strut. Set the hull on a flat table and angle the strut from where the stuffing tube exits the ride pad so it just touches the table at the end. This lifts the hull out of the water on plane while still being stable in the corners. I hand made a radio box for the radio. Shoe Goo for the servos screws. Corrosion X can also be used for added protection. Mount the radio in the LH rear corner of the hull and the steering servo on the right side by the motor. I use a X438, V937 and a X642 on this hull. I ran the X642 at the 1999 NAMBA Nats with a fourth place finish overall. Did you like seeing how Barry setup his boat? Would you like to write an article about your Fast Electric Boat? This Article was written by Barry Janzen Exclusively for Rum Runner Racing. Use of this article is prohibited without written permission from Rum Runner Racing.